If you’ve ever wondered why your mind seems to fail at the wrong times despite every earnest attempt to get everything right, or why following the most touted self-help program to a perfect T still doesn’t yield results as advertised – it’s time you got in touch with your inner kluge. Fortunately, Gary Marcus, professor of psychology at New York University, has written the definitive book on the topic – one that could be administered as an antidote to self help blindness far and wide. Reading Kluge is not unlike being injected with a dose of “ah ha”. The effect of the elixir isn’t to reassure that perfection is attainable if only we do, and think, all the right things, but rather to cogently reveal that perfection was never within reach to begin with. And yet, we still clumsily get by, making due with this strange kluge of a mind that manages to work despite itself. 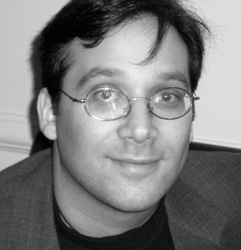 Gary Marcus was kind enough to take a break from a grueling travel schedule to explain a bit about how this all works. 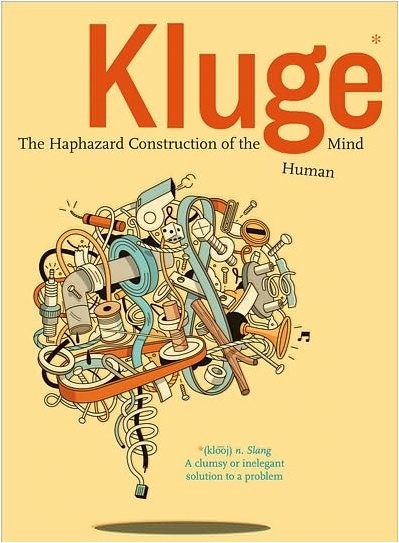 For those who haven’t yet read your book, what exactly is a kluge? The word kluge is a word that engineers use to describe a solution that’s clumsy but surprisingly effective; think MacGyver or Rube Goldberg, duct tape, baling wire and rubber bands. The idea that our minds operate haphazardly seems to fly in the face of our tendency to think that we’re especially well-designed creatures, standing above and apart from the chaotic animal world. What’s your reply when you hear arguments along those lines? We do for sure, in many ways, stand apart from other animals. No other animal has a communication system that’s as sophisticated or powerful as ours, and no other animal can do as much with culture as we can. We do stand apart, but saying that our minds are (in many, not all) respects more powerful than our animal cousins is not the same as saying we are perfect, or even particularly good at what we do. We have, for example, the capacity to reason deliberately, but evolution did a fairly poor job of installing that capacity, such that the deliberate reasoning faculties frequently stand around idle, yielding much of decision making to ancestral mechanisms that are tuned more towards short-term rewards. The thing you have to remember is that human beings have only been around 100,000 years or so, and that’s not a lot of time for evolution to iron out the bugs. You discuss at some length the complementary biases known as confirmation bias and motivated reasoning, and include what I thought was an especially provocative statement: “The reality is that we are just not born to reason in balanced ways.” Can you elaborate a bit on how these biases work together to unbalance our ability to reason? Confirmation bias is the tendency to notice evidence that supports our own theories, even as we miss evidence that might contradict those theories. If you believed in astrology, for example, you might find it easy to remember the days when your horoscope came true, yet tend to overlook the days in which the horoscope seemed off target. Motivated reasoning is kind of the opposite: it’s the tendency to work harder to debunk things that we don’t like relative to things that we do. If we like an idea, we give it a free ride; if we dislike it, we dig in. The net result is that people often insulate themselves from ideas that challenge their beliefs. Republicans watch Fox, Democrats listen to NPR, and very few people ever really change their minds about anything of significance. Your book ends with a number of suggestions for avoiding the pitfalls of our minds’ klugery. The one I found the most compelling in its simplicity is number 13, “Try to be rational.” Is that possible when it seems we begin from a less-than-rational, ‘klugified’ starting point? How do we get there from here? Being rational is not something that comes natural to us, but is (at least to some degree) something we can do; the real trick is to remember to do it. I think of it a bit like trying to fix your golf swing; you may naturally want to bring your shoulders up, but if you work hard enough at it you can learn to keep them down. The problem isn’t so much in keeping your shoulders down for one shot, but in learning to do so routinely. Our problem as a species is not that we can’t behave rationally, but that usually we don’t; simply being aware of that fact can help us to build better habits. You spend some time discussing implications of the ideas addressed in the book for education. What, in your opinion, needs to happen for our educational system to really begin teaching people to think critically, rather than, as you say, rely on “revealed truths”? I think we have to rethink what it is that we want to achieve in our schools. In my view, we spend way too much time having kinds memorize trivia that can easily be looked up on the web; maybe that made sense in the 18th century, but now it’s a waste of time. The memorize-and-test framework exists because it’s easy for teachers and straightforward for students, but it doesn’t leave much that lasts. Meanwhile, so-called “critical thinking skills’ are teachable, but teaching them takes time, just like teaching anything else. So it’s a matter of priorities. Do we want our kids to memorize dates and places, or teach them to think for themselves?